The area turquoise and lead deposits were critical to the jewelry and pottery making of the prehistoric Indians and these mines influenced Spanish settlement. The Cerrillos mining region from 900AD is one of the oldest and most marked of the Indian and Old Spanish mineral developments in the Southwest. At its peak in the 1880s, Cerrillos was full of hearty miners who extracted gold, silver, lead, zinc and turquoise from area mines. The miners supported the town&apos;s 21 saloons and four hotels. The American Turquoise Company sold most of its turquoise from Cerrillos mines to Tiffany Company from 1889-1893. While once seriously considered for the capitol of New Mexico, today Cerrillos, with its dirt streets is a picturesque reminder of the Old West. 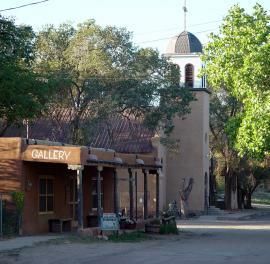 Turn off State Highway 14, also known as The Turquoise Trail, into the Cerrillos Historic District. The local Historical Society has plaques on 19 buildings. You&apos;ll find local turquoise at the Brown&apos;s Casa Grande Trading Post, Cerrillos Turquoise Mining Museum and Petting Zoo, a town landmark and park information at the Cerrillos Hills State Park visitor center. Plan for a few hours and you can enjoy the hiking, biking and horse trails through the state park. The town has been the setting for several motion pictures including Walt Disney&apos;s Nine Lives of Elfego Baca and Young Guns. 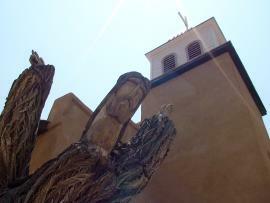 The beautiful St Joseph Church has mass every Sunday.